Alice Garvey in Environment on 19 February, 2017. A slow decline? Sloth species are under threat, mainly due to habitat loss through deforestation. Sloths are currently finding much favour online for their comic appearance, and the slow movement and sedentary behaviour typical of the species is often jokingly compared to some student lifestyles. The pygmy three-toed sloth also won much admiration for its humorous portrayal in the recent ‘Planet Earth II’. But beyond playing a role in the virtual world, sloths are an endangered species facing dangerously real threats. The world’s slowest mammal, sloths may either be two-toed or three-toed, and there are six species in total. The sloth can be found in Central and South America, typically in tropical rainforests. Their very slowness enables green algae to grow on their fur, assisting camouflage in their rainforest environment. Moth species have also been known to have established a mutualistic relationship with the mammal, laying their eggs in the dung of the sloth and then later colonising their fur to breed. See research by the Royal Society for more about mutualism in sloths (‘The Sloth and the Moth: A mutually beneficial relationship’, The Royal Society). The sloth must be promoted as a species – as more than just a ‘cute and cuddly’ presence on the internet. 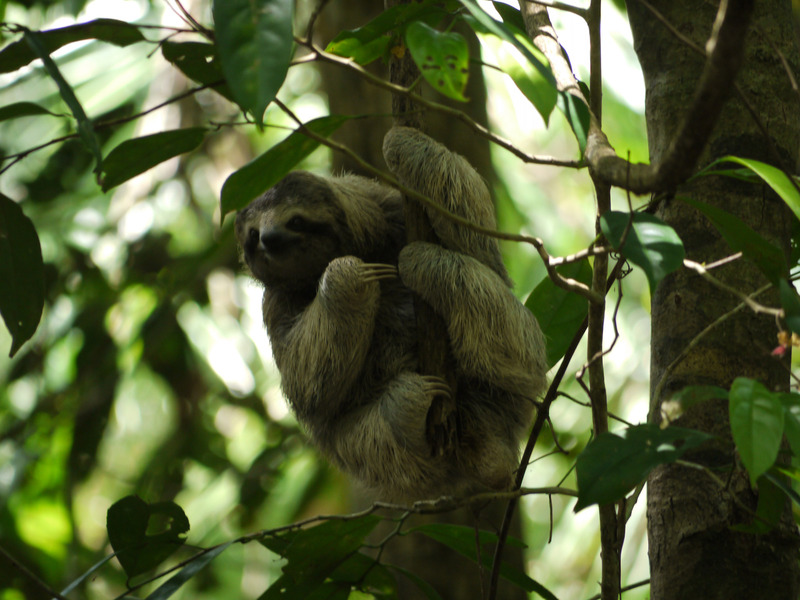 In this way, the sloth can be seen as very much an integral part of the rainforest ecosystem. Despite having a low metabolic rate which means the mammal only stays awake for an average 4-9 hours per day, sloths possess the ability to swim (as seen in ‘Planet Earth II: Islands’). This is due in part to the length of their arms. Sloths are primarily nocturnal animals, eating their diet of fruit, leaf, and vegetable matter at night, and obtaining water from succulent plants. They are suited to a life in the canopies, but struggle when on land, where their ungainly movement makes them vulnerable to predation. The three-toed sloth has an extra vertebra in their neck, allowing them to rotate their heads 270˚ (National Geographic), surely critical to surveillance in their treetop home. The pygmy three-toed sloth will here be explored as a critically endangered sloth species. The pygmy three-toed sloth inhabits mangrove forests. The species was only recognised in 2001, perhaps accounting for its now precarious conservation status. Of the other five species, the maned sloth (Bradypus torquatus) is classed as vulnerable. However, the brown-throated sloth (Bradypus variegatus) is amongst the ‘most common mid-sized mammals in Central and South American rain forests’, according to WWF. The pygmy three-toed sloth population is thought to number less than 500, although there are no conclusive records of their numbers, which are reportedly decreasing. A 2014 IUCN (International Union for Conservation of Nature) report classed the species as ‘critically endangered’. But it is clear, as is the case of many environmental issues, that awareness is one of the primary barriers to conservationist progress. The sloth, particularly the pygmy three-toed sloth, needs to be promoted as a species – as more than just a ‘cute and cuddly’ presence on the internet. The preciousness and importance of the sloth species to rainforest ecosystems, and to world biodiversity more generally, must be recognised. Through conservation efforts and increased awareness, we can perhaps stop this elusive and well-camouflaged species from fading into the background altogether.